Getting the right brick for the right job is an integral part of any building project. Many factors need to be taken into consideration such as colour, size and strength. 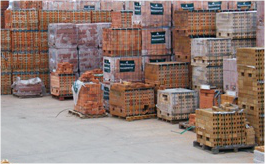 That's why we have an extensive range of bricks from manufacturers including LBC, Terca, PD Edenhall, Hanson and Ibstock.. Our range of bricks include clay commons, clay facing, engineering and concrete bricks. Our staff have over 30 years of experience and can help recognise and match up the brick that you require.